Calls to other Skype for Business and Microsoft Teams users are free, but if you want your users to be able to call regular phones, and you don't already have a service provider to make voice calls, you need to buy a Calling Plan. For more information, see Phone System and Calling Plans. Domestic Calling Plan: Licensed users can call out to numbers located in the country/region where they are assigned in Office 365. Domestic and International Calling Plan: Licensed users can call out to numbers located in the country/region where their Office 365 license is assigned to the user based on the user's location, and to international numbers in 196 countries/regions. Monthly minutes available for each organization and each country/region are located here. The country/region is based on the location of the user's license in the Office 365 admin center > Active users and NOT the billing address listed under the Organization Profile in the Office 365 admin center. You must first purchase a **Phone System add-on license. To do that, sign into the Office 365 admin center and choose **Billing > Purchase services > Add-on subscriptions > Buy now. Depending on your plan, you may need to buy more add-ons before you can buy Phone System licenses. To learn more, see "License options based on your plan" in Microsoft Teams add-on licensing. 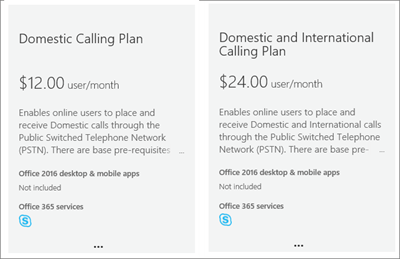 After you buy Phone System licenses, you can buy the Calling Plan by signing in to the Office 365 admin center, choose Billing > Purchase services > Add-on subscriptions, and then clicking Buy now. You'll see the Calling Plans there. You can buy and assign different Calling Plans to different users, depending on the needs of your organization. After you select the Calling Plan you need, proceed to checkout. You assign a plan to each user in the Office 365 admin center. To learn how, see Assign Microsoft Teams licenses. Do you have a service provider that provides on-premises PSTN connectivity for hybrid users? If so, you don't need to buy a Calling Plan. 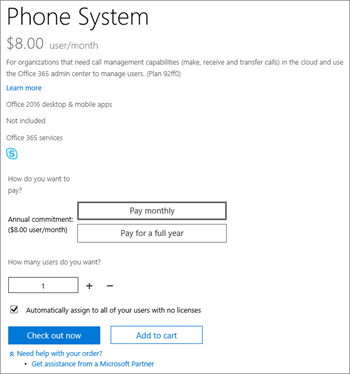 Office 365 Enterprise E5 includes the Phone System add-on, so you can proceed to checkout. 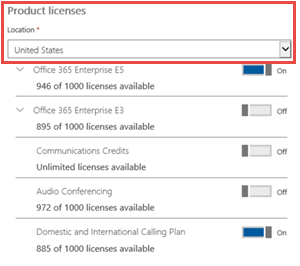 Then, assign the Enterprise E5 or Phone System add-on licenses to users in the Office 365 admin center. To learn how, see Assign Microsoft Teams licenses.